Last Saturday 25. 11. 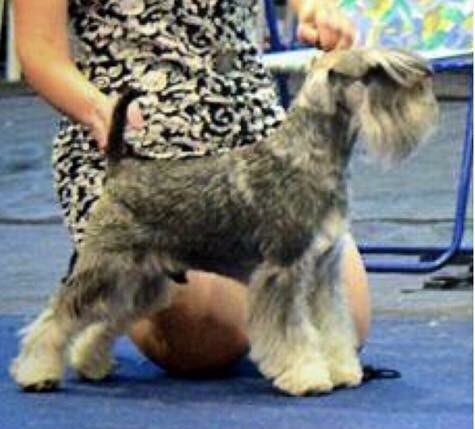 2016 was held a Double Show by the Schnauzer Club in Israel. Judges were Natalja and Bo Skalin and our boy GCH An Affair in Buenos Aires de Trufas Negras was at both shows BEST OF BREED AND BEST IN SPECIALTY SHOW WINNER!!! Huge congratulations to owners Stanislava & Ivgi Vigdergauz. Thanks for the lovely work and dedication with Afonya! I know, you will tell me ‘If I go to a WDS I only will celebrate the World Winner title’… Well, that winning I had the pleasure to celebrate last year in Milano when Messi was BOS; and I know how hard it is to be those big rings running along with worldwide competition, and a lot of fierce eyes starring at you. When a couple of months ago I’ve heard that Afonya was entreated at WDS in Moscow, I will admit it, I was terrified and had no that big hope. I personally have admired the high quality of Russian dogs for years, that much that I have owned two. I knew the quality of Afonya is Excellent, and he had done really well at shows in Israel, but I also know the competition in Russia is strong and with good quality. Then another thing ‘against’ him is that he has natural ears and tail! And, let’s face it, but the facts today are, that cropped/docked dogs still having more chances over naturals. And next thing is Afonya is still a young dog, he will be 2 years old on the 4th of July. Well, as you see, I tend to be more of a ‘pessimist’ or fact checker when it comes to this things… Though my dogs have proved many, many times doing well at shows I was still a bit frightened. Even when there is the fact behind my breeding program proving successful over the years, having produced dogs that became Champions in over 20 countries in 4 continents, I still evaluate things and believe there’s always some things to do better. But this time it was just the overwhelming thought about showing in Russia, Afonya is the first dog of my breeding to be showing in Russia, so I didn’t know how it was like. This show was big and the judge seemed to be not giving away prices; out of 54 male entries ONLY 24 were qualified as Excellent (less than the half of the entries!)! And there was Afonya, awarded EXCELLENT, winning his class, and receiving a CAC, and going further on in the competition to the CACIB; having that privilege is already big. He didn’t make it, he was placed 3rd, right after the CACIB and Res.CACIB winner, both Russian (cropped/docked) males, which I congratulate, I’m sure they are great dogs. Unfortunately I was not there to see, and support Afonya’s owner who traveled from Israel believing in Afonya, and I must say, BRAVO, and thank you! You believed in me once and decided to bring a dog all the way from Argentina to Israel, with the pain of bureaucracy all that involved, and now you believed in him to take him to Moscow and for me we stand high, Thank you Stanislava for showing our boy, JrCH, Grand Champion of Israel AN AFFAIR IN BUENOS AIRES DE TRUFAS NEGRAS. I’m looking forward to see you both next year in a new edition of WDS. GCH An Affair in Buenos Aires de Trufas Negras is sire by ARG. UY. CH. Zelebrität Jackpot ex Unforgettable de Trufas Negras and is owned by kennel Vigdergauz in Israel. CH An Affair in Buenos Aires de Trufas Negras – GCAC, Best of Breed, BIS-1 at Schnauzer club show in Israel! judge: Ekaterina Senashenko. Congratulations to owners Stanislava & Ivgi Vigdergauz, Israel.